It is no secret that the goods and services tax (GST) was launched in India on 1st July 2017. Another day in the country, another tax! And so many reports in both the print and the online media regarding what the GST is and how it will affect the businesses in India. It is ridiculous at how fast paced the tax regimes are and how the businesses are expected to grasp an understanding at an ever-changing pace. We hear you, and we would like to talk a little about what the GST is and how it will affect medical shops and pharmacies because no one else will. We don’t want to dump information, just help; so here goes. The GST is a single indirect tax that is levied in slabs of 0%, 5%, 12%, 18%, and 28%. It’s like a chocolate that comes in different sizes, but it is not nearly as satisfying. Instead of all the other chocolates i.e. taxes like value added tax (VAT), service tax, custom duty etc., it will be one single huge chocolate for the government consumption. GST is revolutionary in that it will stop tax cascading. For example a manufacturer earlier had to pay tax twice, once when raw material was sourced, and once when the finished product was shipped out. GST will now tax the manufacturer only once so that the total cost of the product will come down and the benefit will be passed to the end customer. So no sharing too much chocolate! Also, the tax will only be levied on the effective value addition. For example earlier if a product of Rupees 100 went through two processes of Rupees 40 and Rupees 30 then the tax had to be aid three times, once on Rupees 100, the next time on Rupees 140, and lastly on Rupees 170. Now due to GST the tax will have to be paid three times but on the amounts of rupees 100, Rupees 40, and Rupees 30. This single taxation bill has completely changed the tax scenario in India. So let’s talk about the medical shops and pharmacies in India. The medicine manufacturers will have an advantage under GST, but the shop owners will not have such an easy time. India has close to 8 lakh pharmacies and 60,000 pharma distributors. With the implementation of GST, the old ways of doing business will have to be changed. The first issue is that many medical shops don’t have a GST number and the required GST filing mechanism. As GST comes in three variants, the state GST (SGST), the central GST (CGST), and the integrated GST (IGST) vendors will have to know which tax to apply in what kind of transaction. IGST would apply in an inter-state supply (different state), and CGST+SGST would apply for intra-state supply (same state). The second issue is that different medicines attract different GST. Thus life-saving drugs which were previously taxed 5% are expected to have increased taxes, while food supplements have already been hiked to 18% from the previous 12.5-15%, and medicine supplements are taxed at a flat 28%. These rates will be applicable for not only supplies bought after 1st July, but also the ones in inventory. Thus medical shops and pharmacies will now have to keep a close watch on what they are selling and what is the tax that they charge on it. So what is the solution for medical stores and pharmacies? The answer is simple: a comprehensive pharmacy management software. A magic genie for all your chocolate! However, this can’t be just any other billing software, this has to be a specific GST software that will handle medical store billing and inventory. Registering the medical shop with the government and obtaining the GST number. Keeping track of inventory, including but not limited to over-the-counter medicines, prescription medicines, medical devices, and supplies. Raising reminders when number of medicines and goods fall below a certain configurable number. Billing software that applies the correct GST as per product. Getting updated on new products and the GST that they attract from the relevant sources. Keeping track of bills and filing for tax after every configurable time period. These six points are mission-critical for any medical shop billing software. 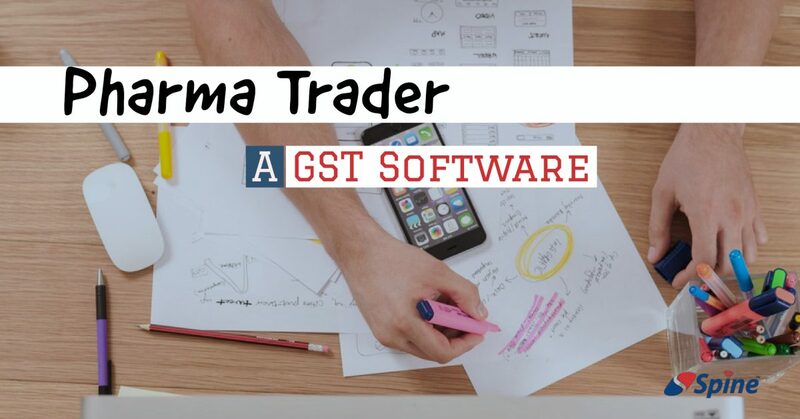 With software like this on your side, you can effectively do business in the new GST regime. And we at Spine Software Systems are more than willing support you in your journey.